With April comes celebration on campus – and we have plenty to celebrate. At the April Board of Trustees meeting, Dr. Natalia Dudareva was named a Distinguished Professor, the highest honor we can bestow on a faculty member. At the same meeting, 23 of our faculty were promoted and/or received tenure. We had 30 administrative/professional staff advance in rank this year through our Administrative/Professional promotion process. Jamie Steiner, a junior in agricultural economics, was elected vice-president of the Purdue student body. And David Salt, professor of horticulture and landscape architecture, was named recipient of the Herbert Newby McCoy Award, Purdue's most prestigious research award. More awards ceremonies are around the corner, so rest assured this list of accomplishments will grow. In fact, next month's issue of InFocus will be devoted entirely to celebrating all of our award-winning faculty, staff and students. And perhaps our most important celebration, graduation, is coming in early May. For me, all of these awards and recognitions simply reflect the excellence that is part of the fabric of this College. We are celebrating much, but we also continue to work through important transitions. With the retirement benefits issue settled, we will turn our attention to developing the broad cost management strategy it will take to close the $25m structural deficit. As activity picks up on proposals to better manage costs on campus, please make sure you stay engaged – your ideas and opinions are important to us as we look at issues in the IT, sourcing, energy, administrative and other areas. We are also working through some important changes in the focus of our primary source of competitive funds from USDA, the Agriculture and Food Research Initiative (AFRI). Dr. Mark Hermodson, Dr. Chuck Hibberd, and Dr. Dale Whittaker, as well as their staff, and our pre-award center are working to provide administrative support for this new AFRI. As a college, we will need to determine what this new funding environment means for how we support our faculty and staff, and how we fund some areas of research not included in AFRI. Important work is also being done on our undergraduate curriculum, our plant sciences area, and how we organize IT in the College, among others. As these initiatives move forward, we will work to be as transparent and inclusive as possible before changes are implemented. An organization such as our College can’t rest on the excellence it currently enjoys. We have to ask some hard questions and explore new ideas as the people we serve, the agencies who support us, our students, and our faculty and staff continue to evolve and change. I am obviously proud of the accomplishments of our faculty, staff, and students. But, I am equally proud of the fact that we are asking those questions that will help us continue to deliver at the highest levels in future Aprils. My thanks to each of you for your role you play in making that happen. Parents and children can learn how to be healthy together and explore electric vehicles during Spring Fest, the annual family festival taking place at Purdue from 10 a.m. to 4 p.m., April 17-18. In addition to the perennial favorite Entomology Bug Bowl, Purdue's Spring Fest will offer new activities. Those include activities related to the inaugural evGrandPrix and a new kid-focused health fair from the School of Nursing. "Spring Fest is a fun way for the public to engage with faculty, staff and students through educational activities," said Danica Kirkpatrick, College of Agriculture events coordinator. "Visitors get the chance to see the lighter side of higher education." A study led by Dr. Klein Ileleji, Agricultural and Biological Engineering, shows that biofuels processors who mill switchgrass into fine bits to help its flowability should be able to save time, energy and money by not doing so. Switchgrass can be used in a number of biofuel applications, but moving it - especially feeding it into boilers - can be problematic, said Ileleji. While corn and soybeans are round and spherical, switchgrass is shaped more like matchsticks, causing pieces to interlock and disrupt its ability to flow. Those blockages cost time and can be dangerous for those tasked with breaking the clog, he said. One of the most common house ant species might have been built for living in some of the smallest spaces in a forest, but the ants have found ways to take advantage of the comforts of city living. Grzegorz Buczkowski, Research Assistant Professor of Entomology, found that odorous house ant colonies become larger and more complex as they move from forest to city and act somewhat like an invasive species. The ants live about 50 to a colony with one queen in forest settings but explode into supercolonies with more than 6 million workers and 50,000 queens in urban areas. Decreasing or increasing the function of a newly discovered gene in corn may increase vitamin A content and have significant implications for reducing childhood blindness and mortality rates, according to a study led by Dr. Torbert Rocheford, the Patterson endowed Chair of Translational Genomics and Professor of Agronomy. Orange corn likely originated in the Caribbean and is popular in some Asian and South American countries as well as in northern Italy. The orange color comes from relatively higher levels of carotenoids, one of which is beta-carotene. Humans convert beta-carotene, which also is abundant in carrots, into vitamin A during digestion. Indiana farmers interested in shifting from conventional to organic grain production should be prepared to rethink traditional crop rotations and view the first few years of production as an investment, according to a study led by Dr. Corinne Alexander, Agricultural Economics. For Hoosier producers, that means the most profitable organic crop rotation begins with corn and soybeans and is followed by wheat and/or alfalfa in a third or fourth year. However, producers won't receive the higher crop prices commanded by organic grains in those years when land is being transitioned from conventional to organic production. "The two big take-home messages from our study are that organic premiums are necessary for making organic production more profitable than conventional production, and the order in which you choose to transition will affect the profitability of that transition," she said. "So, if you're thinking about doing this, there are ways to do it more profitably." Dr. David Salt, Horticulture and Landscape Architecture, was part of a global team that has demonstrated a specialized mapping technique that could speed work in genomic fields by quickly finding genetic associations that shape an organism's observable characteristics. Using plants from 93 different Arabidopsis thaliana populations, a team led by the Gregor Mendel Institute of Plant Biology in Austria was able to find genetic associations among multiple phenotypes, or traits, suggesting that the same genes or closely related genes controlled those traits. The ability to find these types of genetic links could speed scientists' ability to find and isolate genes and understand their function. At the meeting on April 9, the Purdue Board of Trustees ratified the appointment of Dr. Natalia Dudareva as Distinguished Professor of Horticulture and Landscape Architecture. Dr. Dudareva's areas of expertise are plant biochemistry and molecular biology. Her research interests include plant primary and secondary metabolism and volatile compounds. 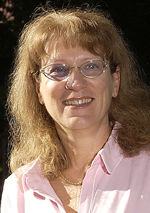 A widely published author in her field, she was elected a fellow of the American Association for the Advancement of Science this year and has received various honors, including the Wickersham Chair of Excellence in Agricultural Research in 2006, the University Faculty Scholar in the College of Agriculture in 2006, the Purdue University Agriculture Research Award in 2005, the DAAD (German Academic Exchange Service) Fellowship in 2003 and the Alexander von Humboldt Fellowship from Germany in 1991. Dr. Dudareva completed her bachelor's and master's degrees at Novosibirsk State University in Russia, earned a doctoral degree in biochemistry and molecular biology from the Institute of Biochemistry in Kiev, Ukraine, and received another doctoral degree in plant molecular biology from the University of Louis Pasteur in Strasbourg, France. Dr. Dudareva came to Purdue in 1997. She was a visiting DAAD scholar at the Max-Planck Institute for Chemical Ecology in Jena, Germany, from 2003-2004. The Purdue Confined Animal Feeding Operations Team was selected to receive the 2010 College of Agriculture TEAM Award as an outstanding interdisciplinary effort focused on an important issue facing production agriculture. The group, which spanned expertise in Animal Sciences, Plant Sciences, Agricultural and Biological Engineering, Agricultural Economics, Sociology, and Communications, conducted novel research and developed fact based information to help stakeholders make more informed decisions about siting of CAFOs in their local communities. To date, the team has produced 20 Extension publications encompassing environmental, heath, and social and economic concerns. The group developed and continues to maintain a website for disseminating these publications as well as other key information and evolving updates on CAFO issues. This site has been visited at least 18,000 times in the past 18 months. The TEAM Award will be presented at a symposium on Friday, April 30 at 2:00 p.m. in the Dean’s Auditorium, Pfendler Hall. Dr. Kevin Keener, Food Science, received the Harold Macy Food Science and Technology Award in March. The Minnesota Section of the Institute of Food Technologies presents the annual award to a scientist who advances the profession and practice of food technology, exemplifies the transfer of food technology and is an outstanding example of cooperation between scientists, industry and government. Keener, who also is director of the Food Processing Environmental Assistance Center at Purdue, has developed a radiant fryer that fries foods with less oil, an in-bag ozonation process that kills bacteria in packaged foods, among his accomplishments. Dr. Krista Nichols, Forestry and Natural Resources and Biological Sciences, has received a Faculty Early Career Development Award. She will use her grant to study the genetics and evolution of migration, using rainbow and steelhead trout. The research will examine the genetic basis of ecological diversity between migrating and non-migrating animals to gain a better understanding of how ecological diversity has evolved within and among species. The work also will provide an important baseline for future studies on the effects of climate change, which has been shown to impact the migration patterns of some fish species. During the project, Nichols will work with a native Alaskan village to document migration patterns of fish and to collect genetic information for use in future studies on the role of genetics, evolution and environment on ecological diversity in migrating animals. This award is funded under the American Recovery and Reinvestment Act of 2009. Kendra Arrington, a graduate student in Agricultural Economics, placed first in the Minorities in Agriculture Natural Resources and Related Sciences (MANRRS) Graduate Oral Research Competition-Division II, during the MANRRS National Conference in Orlando, Fla., March 25-28. Arrington presented her research, "An Evaluation of Consumer Segments for Farmers' Markets in Indiana and Illinois," in competition with other students from across the United States. Kendra was among 18 Purdue students who attended the conference. The Purdue University board of trustees on April 9 approved a waiver of the university's retirement policy for Vic Lechtenberg, Vice Provost for Engagement. Purdue's retirement policy requires university executives and staff in high policy-making positions to retire by the end of the fiscal year in which they turn 65 if they have been employed in their current positions for two years immediately before retirement. Dr. Lechtenberg will continue as vice provost until June 30, 2012. He became vice provost for engagement in July 2004 after having served a decade as dean of Purdue Agriculture. Under his leadership, Purdue's engagement efforts have received more than $33 million in external awards, with seven of the awards exceeding $1 million. Of particular significance was the Department of Labor award, WIRED (Workforce Innovations in Regional Economic Development Initiative), totaling $15 million, which sought to transform the north-central Indiana economy by creating new networks that could quickly create, recognize and act upon economic opportunities. In recognition of his impact on the state of Indiana, Secretary of Commerce Mitch Roob awarded Dr. Lechtenberg the Indiana Economic Development Corporation's (IEDC) 2009 Accelerate Indiana Award. He was recognized as the IEDC's best resource for connecting Indiana's strong academic culture with that of the business world. Purdue has received $14.9 million in funding from the National Institutes of Health to expand Discovery Park's Bindley Bioscience Center for growing its cancer and life sciences research. The NIH's National Center for Research Resources is awarding the money through a federal stimulus measure for the 29,000-square-foot expansion to establish the Multidisciplinary Cancer Research Facility at Purdue. The addition will house investigators from the National Cancer Institute-designated Purdue University Center for Cancer Research to work on innovative animal models of disease, development of new therapeutics and in-vivo animal imaging. April 15: President Córdova and Provost Sands visit to the College of Agriculture; Open forum and Reception 3:00 p.m., Pfendler Hall Dean's Auditorium and Gallery. April 16: 36th Annual James C. Snyder Memorial Lecture Celebration; Agricultural Economics. May 14: College of Agriculture Commencement. Reception 4:00-6:00 p.m., Ross Ade Pavillion, Shively Suites.Reservations Required; respond to Debby Jakes, debby@purdue.edu, by MAY 3. Office of Multicultural Programs calendar for April.